The granddaddy of American monsters is Bigfoot. And, of course, there are reports of the large hairy bipeds in Ohio. The more modern record of Bigfoot in Ohio begins, so far as written accounts go, in 1869 with a news account uncovered by cryptozoologist Mark A. Hall. It concerns the reports from Gallipolis, Ohio, on the Ohio River. The account appeared on January 23, 1869, in an article headlined “A Gorilla in Ohio.” It told of a hairy creature haunting the woods near the town that had jumped on a man riding in a carriage. The man’s daughter, who was also in the carriage, threw a stone at the animal as it struggled with her father. The rock hit the animal’s ear and the “gorilla” departed. 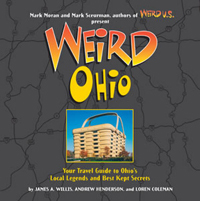 In recent years, one of the most active areas in the East for Bigfoot reports has been Ohio, where the creature even have been given such local names as “Orange Eyes” and “Grassman.” Maybe it is because Ohio has so many people to see the creatures, or there are more of the hairy hominids there. After I moved from Illinois in the mid-1970s, I noted an explosion of activity occurred in Ohio. The state’s place in “Bigfoot” studies became very prominent, due in large part to the early work there of Thomas Archer, Jim Rastetter, Earl Jones, Charles Wilhelm, and especially Ron Schaffner who remains active there today. Maybe then, it has something to do with the large number of researchers who have been involved in field investigations in Ohio. Outside of California, I don’t know of another state that has as many “Bigfooters,” who see themselves as active hunters and researchers of the hairy upright ones. I have myself investigated sightings in the state many times. The residents there are committed Ohio hairy hominid seekers; they are the reason we have heard about so many eastern Bigfoot reports from this one location. One of the best cases of a Buckeye State Bigfoot comes from the 1970s, and was chronicled in some detail by homegrown researcher Ron Schaffner. Just as the famous Momo, the Missouri Monster is to the Show-Me State, Schaffner calls the Minerva case “by far, the most complex and interesting one” in his Ohio files. The rumors of activity east of Minerva actually began surfacing in early July and early August 1978. It was around this date that Evelyn and Howe Cayton’s grandchildren and their friends came running into their Minerva house crying in a frightened state. They claimed to have seen a large hairy monster in a nearby gravel pit. Vickit Keck, and the Caytons went outside to see what had scared them. They saw a creature that was covered with dark matted hair. They estimated it to be about 300 pounds and seven feet tall. “It just stood there,” said Evelyn Cayton. “It didn’t move, but I almost broke my neck running back down the hill.” She later observed the creature in the daylight. It was sitting in the pit picking at the garbage. She could not make out any facial features due to the amount of long hair covering its face. She remembered that the creature had no visible neck. The Minerva sightings then began in earnest on August 21, 1978, at 10:30 PM. In Schaffner’s case notes, he points out that the Evelyn Cayton’s family and friends saw two pairs of yellow eyes from what seemed at first to be two panthers But then, the party saw a large upright hairy creature step in front of the large cats as if to protect them. After the Bigfoot peered in a kitchen window, the eyewitnesses reached for their guns, and the creature suddenly left. A strong stench was still lingering in the area even after a deputy sheriff arrived to investigate. Deputy Shannon proceeded to interview the witnesses. They searched the entire area on horseback and in jeeps, and only found unusual, but unclear footprints. The next night, the hairy biped came back and was visible on top of a hill near a strip mine. Still again, on August 23, the thing returned for a visit, but when Howe Cayton fired a gunshot into the air, it departed. After three nights of visits, Mrs. Ackerman observed two ape-like animals across from the strip mine in broad daylight on September 8. Schaffner and another investigator later learned that before all the Bigfoot activity, one of the Caytons’ German shepherds was found dead with a broken neck. Ron Schaffner, and associate Earl Jones, interviewed the Caytons on two separate occasions. During their second visit, they backpacked and spent the night in the upper woods looking for physical evidence. They came up with no evidence, nor did they witness anything unusual. For Schaffner, one of the most bizarre elements of the incident has always been the sighting of the phantom panthers along with the hairy hominid. Down through the 1970s, 1980s, and 1990s, with an explosion of interest for Bigfoot studies in Ohio, reports of the Grassman and other Bigfoot creatures would pop up now and then, but none were ever as famous as the Minerva Monster, which remain the most intriquing Bigfoot event in Ohio history. A flap of Bigfoot-like creature sightings in Logan and Union Counties, Ohio took place a couple years after the Minerva events, the strangest of which was the encounter reported by Union County legal secretary Mrs. Donna Riegler, who was driving home from work on June 24, 1980. On a stormy evening after a hot, muggy day, with lightning flashing, Riegler slowed to drive over some railroad tracks. Then she saw it––lying on the road, all hunched over. She thought it was a dog at first, but then it stood up, and she second-guessed herself into imagining it was a man. But then it turned and looked at her, and she saw it was a creature, an upright creature, with bent hands held out, palms up. She could not see any facial features but from what she described, it was a definitely a Bigfoot. Riegler drove away, literally escaped as fast as she could, then stopped at the first house she saw, a stranger’s, and was so unnerved that she broke down and sobbed. 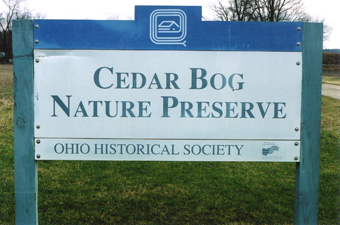 In 1942, the Ohio Historical Society officially listed Cedar Bog as a nature preserve, the first of its kind in the state. Today, approximately one quarter of all the plant species in Ohio call Cedar Bog home, along with over 100 species of birds and many rare reptiles and fish. And if the stories are to be believed, the Bog also has one other infamous resident: Bigfoot. Shortly after Cedar Bog (which is actually a fen) opened, locals began whispering about spotting a huge, ape-like creature walking along Woodburn Road, which runs alongside the Bog. Some claimed it was Bigfoot himself while others said it was an albino relative. One thing they all agreed on, though, was that this creature was too big to be a man and was unlike anything they had ever seen before. 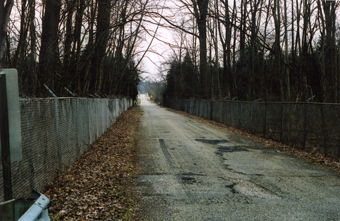 Sometime thereafter, a long, metal fence topped with barbed wire was erected along both sides of Woodburn Road. Most people just assumed it was designed to protect the Bog by keeping people out. But there are some who believe, even today, that the fence was placed there to keep Bigfoot from getting out. Regardless of which is true, we invite you to take a trip down Woodburn Road some dark night and see for yourself if you don’t feel like something is standing on the other side of the fence, just beyond the reach of the car’s headlights, watching you. According to legend, a group of teenagers from Kettering decided to venture outside the city on an impromptu camping trip. The spot they chose to camp was alongside a creek at the far end of a large field. It was a decision they would soon regret. The following morning, when the teenagers hadn’t returned, their parents went looking for them. After a while, they came across the remains of a small campsite, the fire still smoking, but no sign of the missing teenagers was ever found. It is said that they were all attacked and killed during the night by a hideous creature nicknamed the Boggy Creek Monster. True or not, the teenagers were never seen or heard from again. Skeptics claim that there is no Boggy Creek Monster and point to the fact that the name comes from a fictional monster created for a low-budget horror movie from the early 70s, The Boggy Creek Monster. However, it should be noted that the movie was indeed based on an actual monster, the Fouke Monster, which was said to have terrorized the residents of Fouke, Arkansas, in the 1960s. So perhaps, just perhaps, more than one of these creatures exist. And one of them chooses to make its home alongside a creek on the outskirts of Kettering.